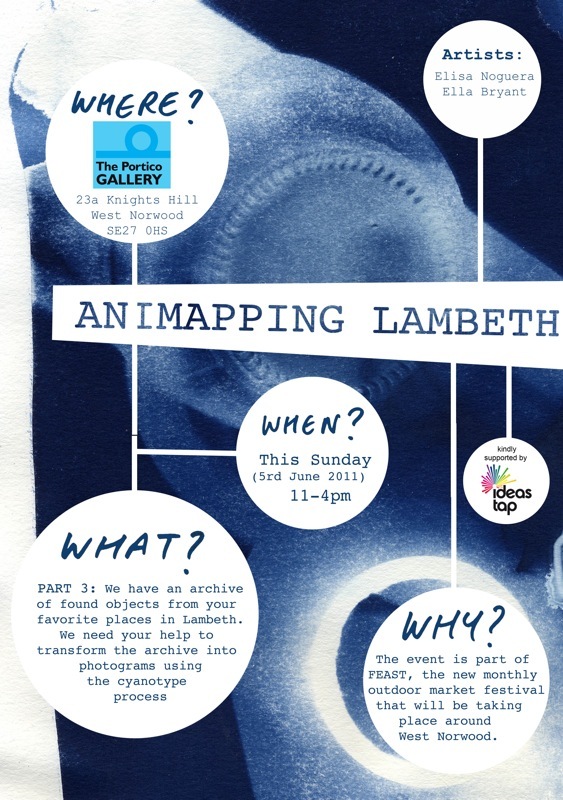 You should all know by now that ‘Animapping Lambeth’ is a participatory art project we have been running at The Portico Gallery on the first three months of FEAST. The project is about using the voices of the people to create 3 animated maps of Lambeth, 1 at each event. At the first event 61 people helped animate our giant hand printed map of Lambeth by transferring portraits of themselves onto their favourite places and using the typewriters to create a key about what makes those places so special. At the second event the public created photographic prints from vintage negatives of the places that were most popular on the map. All the prints were exhibited on the gallery wall forming a picture map of Lambeth from 1900. For the third and final event we will have created an archive of found objects from the peoples favourite spots, and will be inviting people to come along, pick a box and make a cyanotype photogram using the objects inside. If you’d like to participate come on down to the gallery between 11-4pm and sign yourself up to one of the workshops. The sessions are: 11am-12am, 1pm-2pm, 3-4pm and 4-5pm and there will be 10 places per workshop. If you’d like to bagsy yourself a slot email me on ellamarybryant@westnorwoodfeast.comgmail.com with your preferred time. All workshops are FREE (donations most welcome though)!